There is a handful of bespoke books dealing with various aspects of orchestration. Treatise on Instrumentation by Berlioz (Dover ISBN-10: 0486269035; ISBN-13: 978-0486269030) is the oldest. Principles of Orchestration by Rimsky-Korsakov (Dover, ISBN-10: 0486212661; ISBN-13: 978-0486212661) is of equal value and from almost the same era. Walter Piston's Orchestration (Norton ISBN-10: 0393097404; ISBN-13: 978-0393097405) is a classic, while Study of Orchestration by Samuel Adler (Norton ISBN-10: 039397572X; ISBN-13: 978-0393975727) is by far the longest; Essential Dictionary of Orchestration (Alfred ISBN-10: 0739000217; ISBN-13: 978-0739000212) the most compact. 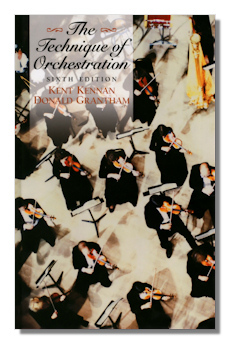 The Technique of Orchestration by Kent Kennan and Donald Grantham, published originally in 2002 by Prentice-Hall, is now in its sixth edition from Pearson and easily holds its own with those other titles. Kennan is Professor Emeritus of Music at the University of Texas at Austin. Fellow composer Donald Grantham holds a MM and DMA from the University of Southern California. In fact, the credentials of both authors to produce a book of this sort could hardly be better. The 400 or so substantive pages of The Technique of Orchestration are divided into 21 chapters of between six and thirty pages each. After a short introduction, but one that sets the very positive scene by being packed with well-contextualized facts and information, not vague narrative, the families of the orchestra are exhaustively dealt with. And in a far from mechanical way. Although this book is comprehensive and heavy on facts, it's also extremely well-conceived in the way that it has divided and ordered its material. In the case of strings, for example, there are three separate chapters: on the four members of string family; the strings in the orchestral context; the specifics of bowing, and "special effects". Similarly, there are separate chapters – each just as packed and encyclopedic in coverage, yet accessible and easy to work from – specifically on scoring for each section of the orchestra, in the context of transcription, and where special "treatment" or problems need to be addressed. These extremely helpful chapters are also preceded by short introductions to specifics… scoring chords for woodwinds, horns and strings, for example. And of course a whole section on percussion (pitched and indefinitely pitched), as well as harp, celesta and piano in various contexts. There are chapters on "Special Devices" (really a brief exploration of the "extreme" demands of registration, dynamic and technique made by some contemporary music); infrequently used instruments from the saxophone to Heckelphone, E♭ flute to Ondes Martenot (that the oboe d'amore and harpsichord are discussed in this section indicates the general center of gravity of the book – the mainstream orchestral repertoire of the past 250 years); scoring for high school; scoring (including the production of parts) as a technique in its own right. The last 20 pages or so of the book are devoted to nicely-condensed appendices on instruments' names in English, Italian, French and German; the ranges of instruments, voices and electronic instruments. As well as an introductory chapter on ways in which to use The Technique of Orchestration (it does have a student feel about it… each chapter has assignments), there is a bibliography and a good index. It's a particularly well laid out book. Well-annotated score extracts abound; these are always clear and apposite. The accompanying CD contains 91 samples easily cross-referenced to and from the relevant chapter. Although this is not an encyclopedia or dictionary of instrumentation, each chapter, section and subsection is laid out in such a way that the salient aspects of working with each instrument are easy to find and use; this makes using The Technique of Orchestration as a reference work very handy. There are black and white photographs of many instruments (or families) and – in addition to the suggestions for listening – detailed allusions to, mentions of and commentaries on (prominent) occurrences of each instrument in the repertoire. The standard of production and printing of the book (it's perfectly bound, so easy to lay flat) is high. There is also a workbook that's available separately. The Technique of Orchestration will not disappoint, then. It addresses several audiences well… teachers, students working both on their own and in class, professionals and listeners. To meet multiple needs quite as expertly as Kent Kennan and Donald Grantham have done with such comprehensive, detailed, up-to-date, well-constructed, well-illustrated and accessible (finding just what you want is easy) coverage of a wide field is a huge achievement. It's matched by a demanding price. But if this is your only source of its kind, you won't be disappointed: the vast majority of what you need to know about instrumentation, orchestrating in score and the abilities, strengths, special "needs" of most instruments in use today (outside the "early" and non-Western music fields) is exemplary. This is a book that can be recommended without hesitation. Copyright © 2011 by Mark Sealey.